Salesforce Co-Founder Parker Harris and Principal Mobile Architect Qingqing Liu showed off Einstein Voice at Dreamforce '18. Take a look. Salesforce has helped our customers succeed as the #1 CRM company year after year. But the fact is getting granular, real-time data into Salesforce that you can take action on could be easier. What if you could talk to Salesforce, and let artificial intelligence make the best use of that information? Now you can, thanks to Einstein Voice. There is clearly a demand for this kind of technology. Fifty percent of all searches will be voice searches by 2020, according to comScore. Let’s say you have a productive meeting with a customer on the road and want to log your updates into Salesforce, but you have to run to another meeting. your Instead of sending a text or email to your team, or waiting to manually enter your activity notes when you get back to the office, you will be able to use Einstein Voice to verbally log the update through the Salesforce mobile app. Einstein Voice will intelligently find the relevant records and automatically updates fields with the latest information, creates follow-up tasks, and notifies teammates. Einstein Voice is a game changer. As data entry gets easier and fast, reps will be entering far more information into Salesforce. And because reps can make updates from anywhere, they can update Salesforce with information while it’s still fresh in their minds. Everyone wins: Sales managers will be armed with real time insights, and reps will be more efficient and productive. And because Salesforce Einstein is built into the Salesforce platform, it will have more data to crunch so its predictions and recommendations will be even smarter. Here’s how our artificial intelligence makes this all work. 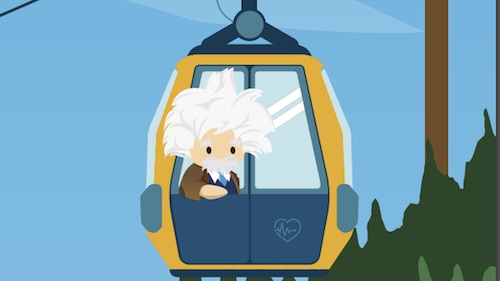 As you verbally dictate your memo, Einstein Voice transcribes the audio stream to allow our natural language understanding models to classify what types of updates you need to make to the various fields in Salesforce. It then extracts and normalizes the inputs to match the required field formats, like the close date and deal amount for a given opportunity. We are not only thinking about how actions impact your business, but also what you need to do next. So Einstein Voice Assistant can create tasks and understand terms like “next month” to make sure Salesforce reminds you at the appropriate time. 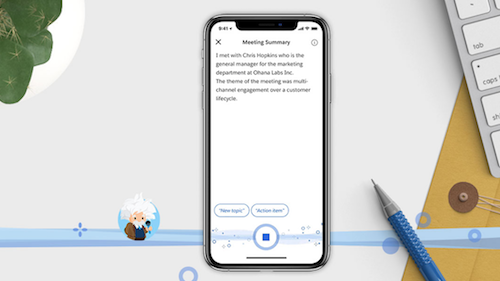 Einstein Voice Assistant finishes this all off by logging an event on the record and ensuring all relevant contacts are included in the event’s details, making you more productive. That’s our first new product, Einstein Voice Assistant, which enables conversational updates to Salesforce and puts them to work with AI. A second product, Einstein Voice Bots, enables our customers’ customers to build their own voice-activated assistant, brand it for their company, and engage the end-customer on any smart speaker. With voice we’re entering into a new era for how people interact with Salesforce, delivering entirely new levels of productivity for our customers.